If you want to enjoy a real memorable night of entertainment in Cairo? 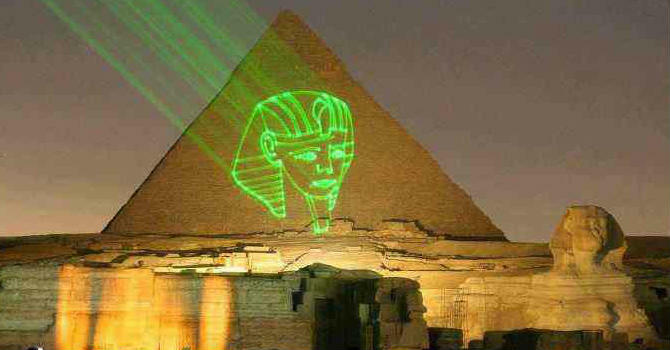 Then give yourself this chance to attend the world known the Sound and Light Show in Giza Pyramids at night ! You'll listen to the story of Egypt over the ages through the eyes of great Sphinx and watch the outstanding site of the illuminated pyramids under the starry sky. The show at Great Pyramid of Giza lasts for 1 hour. It starts with the Sphinx lightening, it will recount the history of the Giza pyramids & their builders. Using laser rays and light designing on walls of the Valley Temple, surrounding sands, walls of the pyramid and the Great Sphinx itself. Finally you will be taken from the complex gate to transfer back to your hotel.